Inghams Poultry Abattoir 2013: Summary of Incidences. 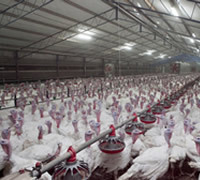 Factory farmed turkeys spend their entire lives in crowded sheds with thousands of other birds. Three to five million turkeys are currently killed every year in Australia for meat but this number is growing. Turkeys each live in a space the size of an A3 sheet of paper, until they are slaughtered at approximately 10 - 12 weeks (a turkey's natural life span is around 10 years). The Big Birds, Big Cruelty campaign, launched in 2011 by Animal Liberation ACT, aims to encourage wide scale action to expose and bring to an end the suffering of factory farmed turkeys in Australia.